Join us for "The Sport of Kings" played by members of the Toronto Polo Club on the Commons in Niagara-on-the-Lake. Niagara Polo features two four-chukker games with players from the Toronto Polo Club, traditional divot stomp with bubbly, half-time entertainment, food & drink vendors, music, artisans, and a whole lot of fun! Save $5 now! Admission is $15 in advance or $20 at the gate. Free for children under 12. Bring a chair and a big hat and experience the Sport of Kings! Visit www.niagarapolo.com for more information. Presented by the Niagara Historical Society & Museum. All proceeds support the museum. 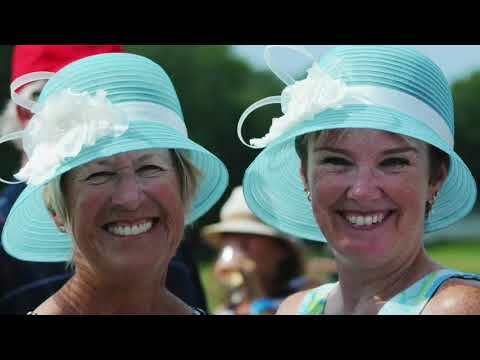 Bring your best hat, your best friends, and enjoy an afternoon of Polo and fun in historic Niagara-on-the-Lake! Local wine and beer are available at the bar. Food options will be available for purchase or feel free to bring your own picnic lunch. Vendors include Niagara Polo merchandise and other local artisans. No outside alcohol is permitted. Enjoy gourmet dining under a field-side marquee with a VIP or Corporate package! Please call 905-468-3912 or email aklassen@nhsm.ca for more information. Gates open at 11:00 am. All proceeds support the Niagara Historical Society & Museum. The Commons - King Street and John Street access - A National Historic Site of Canada, The Commons was home to a military training ground from the First World War up until the 1960s. Polo was played on this very field by military officers and gentlemen. Relive the history of The Commons at NIAGARA POLO! All profits benefit The Niagara Historical Society & Museum (NHS&M), located in Niagara-on-the-Lake, Ontario. The museum is home to one of the finest collections of early Canadian artefacts and archives. The Museum’s permanent exhibition, “Our Story”, chronicles the history of Niagara-on-the-Lake from its earliest inhabitants to the present day. Memorial Hall holds two temporary exhibitions each year that showcase the Museum’s unparalleled collection and celebrate the history of one of the oldest settlements in Ontario. Through research, publications, exhibitions, lectures and programs, this NHS&M strives to preserve the rich heritage of its community for future generations.